The discrimination against and exclusion of the indigenous population is one of the fundamental causes of the Oaxaca rebellion. No one can ignore it in the land of Benito Juárez, the Zapotec Indian who became president of Mexico in 1858 and led the War of the Reform against church power and the resistance to the empire of Maximilian1. The Popular Assembly of the Peoples of Oaxaca (APPO) recognized this in the resolutions of the forum on “governability” which it called in mid-August. However, the Indian question is not limited to the legal framework or democratic rights, nor to the removal of this or that cacique (political boss), or even the whole cacique system promoted by the PRI (Institutional Revolutionary Party). To liberate the descendents of the original inhabitants from the weight of half a millenium of plundering, superexploitation and even genocide, both under colonial rule and the republic, will take a social revolution. Only the taking of power by the Mexican working class will make it possible to shatter the power of a bourgeois and even oligarchic ruling class in states like Oaxaca, where their fabulous riches are extracted from the sweat of indigenous working people. The criollo (European-derived) caste which rules Oaxaca is extremely tight-knit: its members see each other in sumptuous feasts held in luxury hotels and the exquisite restaurants which abound in this colonial city; they visit each other’s estates to admire the prize bulls and purebred horses. The political bosses maintain gangs of gunmen and thugs commanded by corrupt deputies and congressmen to assassinate rebellious teachers. The oligarchs flamboyantly wheel around town in their latest-model SUVs with oversized tires and polarized windows – known as “garcmobiles” during the El Salvador civil war of the 1980s – from which demoiselles in party dresses alight to attend their elegant fiestas. Their offspring practice endogamy, marrying only within the caste, and they all display openly racist contempt for those with dark skin. These are the “powers that be” who lord it over the state of Oaxaca, and they were the ones who came out on November 1 in a PRI march to support Governor Ulises Ruiz Ortiz. They wanted a “cleaned-up” city, some ladies told an American reporter, claiming that a majority of the “appos” are from Chiapas or Guatemala (i.e., they are Indian “foreigners”) and that the leader of teachers union Section 22 is a muxe (transvestite). The reporter, James Daria, noted the “deep seated economic and racial conflicts underlying the current social unrest” (Narco News Bulletin, 1 November). The deepest of these is the Indian question. “We have already been warned … they already have their cuernos [de chivo, goat’s horn, nickname for AK-47 automatic rifles) ready for when the damn Indians of the APPO show up,” remarked a rich cattleman of the lower Mixe region, according to Carlos Beas Torres, a leader of the UCIZONI indigenous organization (La Jornada, 16 October). The striking teachers have raised among their demands defense of bilingual education against budget cuts which have hit hard against instruction in Indian languages. Meanwhile, PRI-linked paramilitaries have made death threats against the coordinators of radio Huave (the most powerful community radio station in the Isthmus of Tehuantepec), Radio Ayuuk and Radio Umalalang. This “other war” against the indigenous peoples is not limited to threats: in early August when a delegation of a Triqui Indian organization, MULTI (Movimiento de Unificación y Lucha Triqui Independiente), set off to reinforce the teachers’ encampment in the Oaxacan capital, they fell into an ambush which left three Triqui Indians dead (Andrés Santiago Cruz, Pedro Martínez Martínez and the youth Octavio Martínez Martínez) and four wounded. And on October 18, a teacher of bilingual primary school, Pánfilo Hernández of Zimatlán, was murdered as he left an APPO meeting. Nor is this war new. The Triquis, ensconced in the Mixtec region of western Oaxaca, have been the target of constant aggression by the state and federal governments in support of PRI caciques, leading to the murder of many fighters for Indian rights going back to the 1970s. Among those killed are Guadalupe Flores Villanueva, Luis Flores García, Nicolás López Pérez, Eduardo González Santiago, Efrrén Zanabriga Eufrasio, Pedro Ramírez, Javier Santiago Ojeda, Paulino Martínez Delia and Bonifacio Martínez. Another of the murdered activists in previous years was Bartolomé Chávez of the CIPO (Popular Indian Congress of Oaxaca). 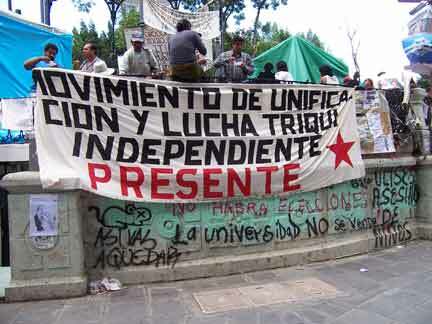 Banner of the MULTI in the Oaxaca Zócalo, August 2006. With 1.6 million Indians, more than half the total population, Oaxaca is the state with the highest percentage of the population who speak indigenous languages (37 percent, compared to 24 percent in Chiapas), including Zapoteco, Mixteco, Mazateco, Chinanteco, Mixe, Triqui and ten additional ethnic groups. Of the 570 municipalities in the state, 412 are governed according to indigenous “usages and customs,” under which municipal posts are determined by a rotating series of positions or obligations (cargos) and general assemblies make decisions by consensus. Although they are less corrupt than many other local governments, one doesn’t have to idealize the traditional indigenous governments. There are also PRI Indian caciques, and in a significant number of Indian communities (around 20 percent), even in the late 1990s, women didn’t have the right to vote. There is also little presence of women in the leadership bodies of Section 22, even though women make up a clear majority of Oaxacan teachers. The centrality of the oppression of indigenous peoples in the present struggle in Oaxaca is widely recognized. In the APPO forum, resolutions called for a new state constitution to include “juridical recognition of the original peoples and their rights, among them the use of indigenous languages and acceptance of the accords of San Andrés Larráinzar.” However, neither legal recognition nor the autonomy codified in the San Andrés accords, negotiated with the Zapatista Army of National Liberation (EZLN) after the Chiapas rebellion of 1994, offer a solution to the profound social oppression of the indigenous peoples. This oppression is rooted in capitalism. Just to cite some indicative figures: the areas of Oaxaca populated by Indian peoples are the most backward in terms of education and in the state as a whole, 27 percent of women are illiterate while 34 percent of primary school age children do not attend school. The poverty is enormous: 70 percent of the Oaxaca population earns less than 70 pesos (US$6.50) a day. 55 percent of homes lack sewage connections or any drainage, while 40 percent of the houses have dirt floors, according to statistics of the INEGI (National Institute of Geography and Statistics) based on the 2000 census. Currently, poor Indians feel particularly threatened by the Plan Puebla-Panamá, which has led to massive buying up of Indian lands by speculators who want to grab a corridor alongside the superhighway. “Marxists support the right of the native peoples to decide their own fate. For the areas where Indians are concentrated, we join in demanding the right of regional and local autonomy. For this to have any reality, it must include control over natural resources, including land, water and petroleum. This will be strenuously resisted by Mexico’s capitalist rulers, as the state of Chiapas, where the Mayan Indians live in pervasive poverty, produces 21 percent of the country’s oil output, 47 percent of its natural gas, and 55-60 percent of total electrical production, mainly from hydroelectric stations…. Oaxaca does not have huge natural resources like Chiapas, but there is another reason why genuine regional autonomy cannot be realized within a bourgeois framework. The peasant Indian economy is deeply threatened by the capitalist market, which is the ultimate cause of the poverty in which the indigenous peoples live. This has been the case since the triumph of capitalism in the Mexican countryside in the last half of the 19th century, but its effects have been accentuated in the last decade by the Free Trade Agreement with the United States, which has led to the importing of massive quantities of corn and the ruin of Oaxaca’s peasant agriculture. Despite its rhetorical identification with the Mexican Revolution, the PRI arose from the layer of Northern ranchers (Obregón, Carranza) who were responsible for the assassination of Emiliano Zapata and Francisco Villa and the defeat of the poor and landless peasants. The same ranchers are still in power in Oaxaca, and following their class interests they identify with the hacienda owner from Guanajuato, President Fox. Expropriating their estates will be one of the first steps of any social revolution. Yet not even Zapata’s old program of “land to the tiller” will be sufficient to deal with this. Almost half of the cultivated land in Oaxaca is under a communal regime, another quarter is in the ejido2 system, with little more than a quarter held as private property. Even with collective cultivation of the land, the urgently needed agrarian revolution in the Mexican countryside requires the industrialization of agricultural production, which will only be carried out to the benefit of the indigenous peasants in the framework of a socialized economy. It is also essential to break with all the bourgeois parties. 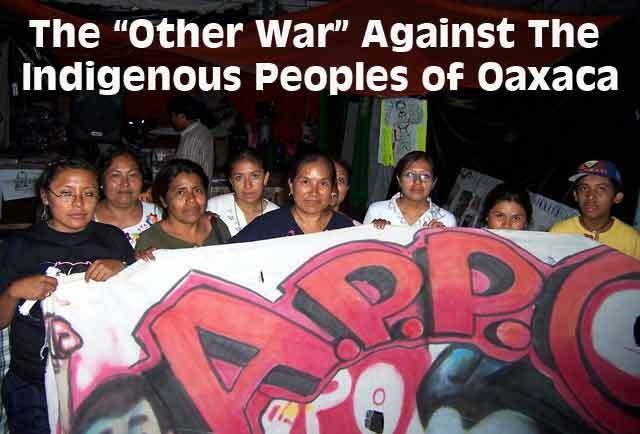 The most important struggle of the Oaxacan Indians in the past was that of the COCEI (Worker-Peasant-Student Coalition of the Isthmus) centered on Juchitán, dating from the mid-1970s. For a time, the COCEI was allied with the Mexican Communist Party, and COCEI members were always treated as communists by the PRI caciques. With the dissolution of the remnants of the CP into the Party of the Democratic Revolution, the COCEI also joined the PRD. After many years of mobilization, the COCEI achieved power locally. However, as members of a capitalist party, the Juchitán COCEI/PRDers have aligned with the rulers of the state and played a markedly conservative role – to the point that in the current struggle, a significant number of teachers in Juchitán broke the strike. It is notable that the only place in the state where there was a significant amount of scabbing was precisely in this stronghold of the PRD. The struggle to defend the original peoples is also not identical to zapatismo, although the appearance of the EZLN in 1994 did attract a great deal of attention to the conditions of Indians in Mexico. The political support which the EZLN gave for many years to the PRD didn’t help indigenous peoples in Chiapas or the rest of the country, as Subcomandante Marcos himself admitted in his June 2005 Sixth Declaration of the Lacandón Jungle. “It saddens us to see that the EZLN says something when something happens to those who are well-known, yet when blows are struck against communities, organizations and persons who are small, simple and little-known, they say nothing. It is no accident, then, that during the current teachers strike in Oaxaca, even though it has involved hundreds of thousands of indigenous people, the EZLN and its “Other Campaign” have played no role at all. 1 Benito Juárez, 1806-1872, became president of Mexico when civil war broke out in 1858 over a series of liberal reform laws establishing the separation of church and state and curtailing ecclesiastical power. After three years of fighting, the liberals led by Juárez triumphed. However, when the liberal government had to suspend payment of interest on foreign loans, its main creditors, England, France and Spain, sent forces to seize the Veracruz customs house. Louis Napoléon, the emperor of France, then decided to occupy the whole of the country, and with the connivance of Mexican monarchists he selected Maximilian I of the Austrian Habsburg ruling house to be emperor of Mexico. Juárez retreated to the north where he established an “itinerant republic.” After the defeat of the South in the American Civil War, Napoléon withdrew his support from Maximilian. When French troops pulled out, the republican forces led by Juárez retook the capital in early 1867. 2 Ejidos were lands reserved for common use of the indigenous population during colonial times; under the land reforms following the Mexican Revolution of 1910-17, in Indian areas land was collectively owned by the community as ejidos and periodically parceled out among the members, although generally cultivated in individual family plots. 3 Non-Governmental Organizations. While supposedly not (directly) funded by local governments, many NGOs are funded by imperialist foundations and governments, particularly the U.S.